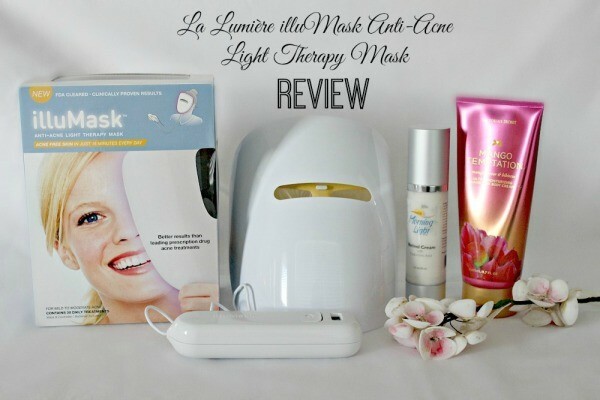 Read on for my illuMask Anti-Acne Light Therapy Mask Review and see if it’s right for you. Have you ever wondered if light therapy really helps to improve your skin? I have. I was definitely skeptical until I received a facial which included light therapy. I walked out of that facial a new woman. OK, maybe I’m being a tad bit dramatic but seriously, my skin looked amazing and it stayed that way for weeks. 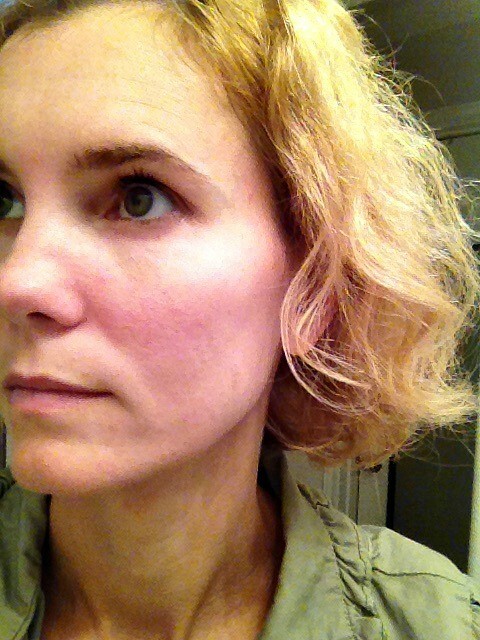 I suffer from rosacea and mild acne, which means that I have bumps and uneven skin tone. And then there’s that aging thing… Good times all around! 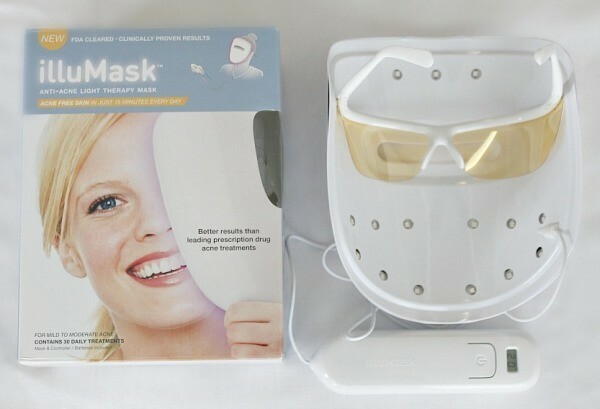 So when I was approached with the opportunity to test the illuMask Anti-Acne Light Therapy Mask, I jumped at it. Now that we’re into this weird Texas season supposedly called Fall, my skin has been freaking out. Why? With the changing of seasons where it’s hot one day and cold the next, this change in temperature can cause havoc on our skin. I’m proof of that. What Is This Mask Thing? Before I give my results, let me tell you a little about this mask. 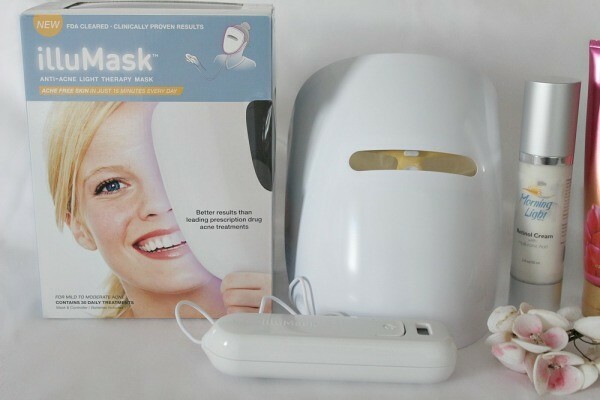 The mask uses specific wavelengths of red and blue light to treat and prevent breakouts. The red light reduces skin’s inflammation, heals break outs and evens your skin tone while the blue light kills acne-causing bacteria, reducing current acne and future blemishes or breakouts. You use this 30-day device for 15 minutes every evening. I treated it as a little relaxation and spa like time for myself. I put on the mask, lie down, close my eyes and relax. The lights automatically go off after 15 minutes, so you don’t even have to worry about timing yourself. Just relax and enjoy the treatment. After I’m done, I finish up my nightly routine with my Retinol Cream, Eye Gel and body lotion. My family has been very entertained the past couple of weeks as I lay in bed with this on my face. It glows, causing me to glow and creates a purple aura around me. They’ve even taken my picture and said that I looked ‘slightly terrifying’. I told them they wouldn’t be laughing any longer after I had gorgeous skin. Does it work you ask? I would have to say a definite YES. I have noticed a big difference in my skin and so has my husband. He looked over at me the other day and said “Your skin looks amazing.” That made my day! Here’s what I looked like before. EEK! Here is the after picture. 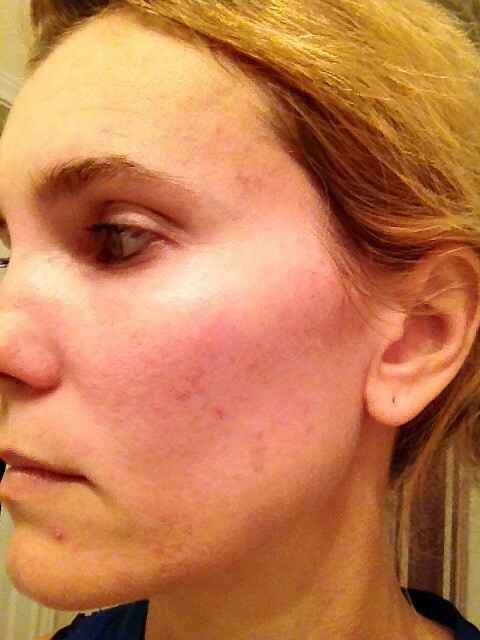 This is after using the illuMask for 10 treatments of the 30. It’s hard to really tell the extent of improvement on my skin from my low quality iPhone 4s pictures, but I can tell you I have fewer blemishes, a more even skin tone, the redness has diminished and the overall look of my skin has improved. I will gladly continue to use this for the entire 30 days and am looking forward to seeing my skin results. It’s a 30 day treatment, which means you throw it away when you’re done. That’s a huge device to just throw away in the trash, and my love for our planet causes me to cringe thinking about all of the illuMasks in the trash. I really, really wish there was a way to recycle it through the company. It also starts hurting the bridge of my nose and the side of my head after a few minutes. At first I tried to sit up and watch TV, but it hurt too much. I also was a little worried about the affect on my eyes from the lights, even though it has eye protection. But that’s just me. I would recommend laying down and closing your eyes while using this to be most comfortable. I wish it lasted longer than 30 treatments and I’m a little skeptical as to LED lights not working for a longer period of time. But I’m no expert. There are of course re-wiring hacks out there already for this mask to make it last longer. You can purchase the illuMask at Ulta, Walmart or Target for $30. Will I Personally Buy It? It’s $30 for 30 treatments, so when you do the math that’s $30 a month. I know. I’m a math genius. I don’t think it’s something I’ll purchase or use every single month, but for a light treatment for $30 that I can do in the comfort of my own home, it’s something I would use several times a year. What I really want to find out first is how long my skin stays looking like it looks now, after I’m done with the 30 treatments. I’ll do an update on that later. Have you tried the illuMask? Do you want to try it? Let me know if my review encouraged you to purchase it or not. *Disclosures: Mom Fabulous was sent product to facilitate this review. No other compensation was received. All opinions are 100% my own. *This post contains affiliate links and when you click on a link and purchase through it, I will earn a commission. I have a few questions about this mask. Do you have an email address so I can email my questions to you, please? Hi Jennifer, You can reach me at julie at momfabulous.com. Google illumask hack and you will find instructions on how to make it work past the 30 treatments. There is even a video on YouTube. It requires soldering one single wire and does not look very difficult.